A quicker way to access Control Panel utilities is to configure the Start menu so that the individual Control Panel utilities appear in a sub-menu to the Start menu Control Panel menu item. 1. In Control Panel click on Appearance and Personalization and on the Appearance and Personalization page select Taskbar and Start Menu. 2. In the Taskbar and Start Menu Properties dialog box that appears, click on the Start Menu tab. 3. On the Start Menu tab click on the [Customize...] button. 4. In the Customize Start Menu dialog box that appears, under Control Panel, set the o Display as a menu radio button. 5. 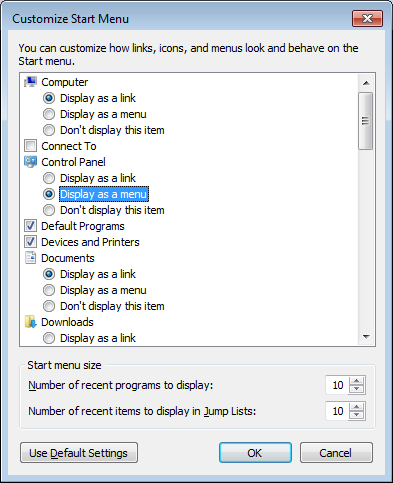 Click on the [OK] button to close the Customize Start Menu dialog box. Click on the [OK] button to close the Taskbar and Start Menu Properties dialog box. 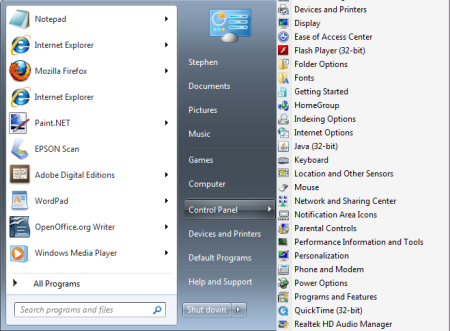 Now you can access individual Control Panel utilities as a sub-menu to theStart menu Control Panel menu item.